Like any student who embarks on their journey through college, I spent much of my undergraduate years at American University discovering my identity, sense of belonging and interests in life. As I reflect on those days not so long ago, I now realize how important being a part of a cultural student group was for me and the impact it had on my sense of identity. For me, my involvement in the Philippine Student Association played a significant role in how I came to identify, both individually and within a community. Knowing that, it is difficult for me to imagine experiencing those moments of self-searching and struggle while also having restrictions on my ability to find my community. Imagine having your student organization be the target of a police surveillance program just for the mere fact that your student organization is racially, ethnically, or religiously-based. Well, it happened in New York and beyond. Student groups, in this instance Muslim student groups, were targeted by the New York Police Department (NYPD). But, it doesn’t just stop there. 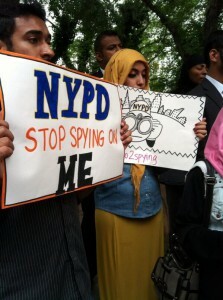 It’s not a secret that the NYPD has long-been spying on student organizations, places of worship and businesses. 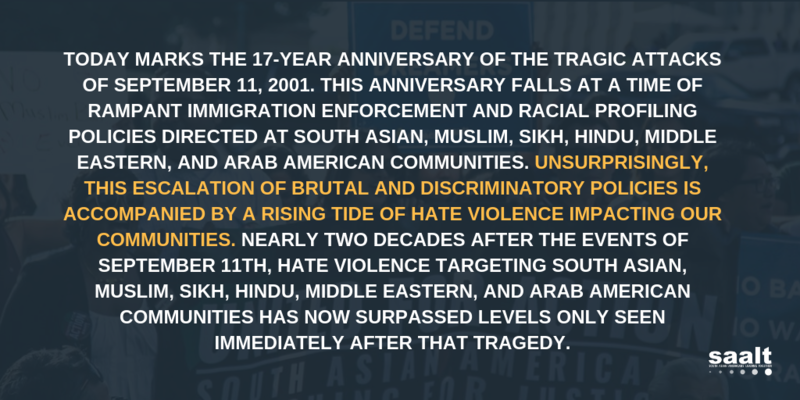 In fact, just a few months ago, the Muslim American Civil Liberties Coalition and the Asian American Legal Defense and Education Fund (AALDEF) released a report which documents this surveillance program and its impact on the Muslim community since its inception in 2002. Needless to say, the effects on the Muslim community have been drastic, causing individuals to restrict their speech and religious practice as well as their everyday activities. And, with the recent release of evidence that the NYPD has been conducting in-depth surveillance on Muslim Americans by designating them as “terrorism enterprises” and trying to infiltrate at least one local community organization, I can only imagine the impact that this will have on individuals. Moreover, as a recent college graduate, I can’t help but wonder what this means for 17 and 18 year olds as they embark on their college experience, a time many Americans use to find themselves, figure out where they belong, and build community. Being a part of a student group and participating in cultural activities helped me to feel a sense of belonging and allowed me to learn more about Filipino culture and history during my four years at American University. It provided me a space in which to connect with peers who shared similar experiences and struggles. It’s disheartening to know that my peers will not have the same opportunity, which is such a big part of the college experience. What’s worse, if they chose to explore their identity in these traditional ways, their civil rights may be violated as well as their privacy. We cannot not let the NYPD or other government agencies limit the ability of youth to find their identity or of anyone else to engage in their community by threatening their civil rights and religious freedom. We must demand accountability from our government agencies and officials. We must move forward — not backwards – because a better future is ahead of us. We owe this much to our youth, our communities, and our nation. 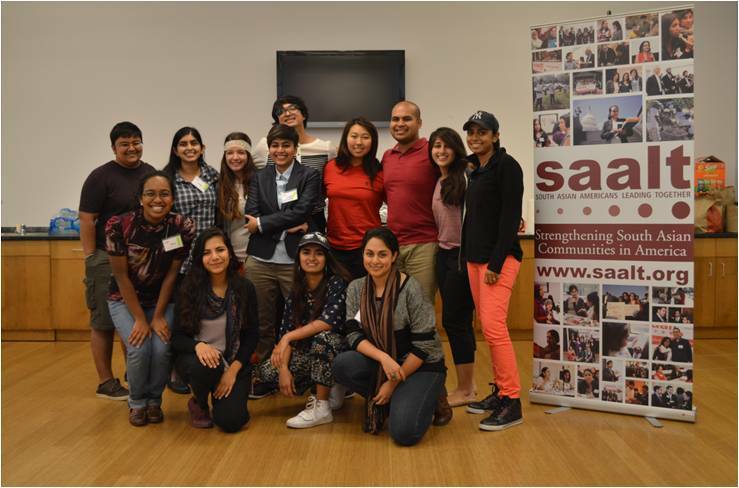 SAALT’s Young Leaders Institute (YLI) is an opportunity for undergraduate students and other young adults to build leadership skills, connect with activists and mentors, and explore social change strategies around issues that affect South Asian and immigrant communities in the US. The 2015–2016 Young Leaders Institute will focus on addressing and confronting anti-Black racism. Students will develop projects to address and confront anti-Black racism among South Asian Americans on their campuses and in their communities. “You should take those to the Hispanic grocery stores,” says Ahmed, a Pakistani immigrant who sells phone plans outside the local Indian market. He says it in an effort to help me improve my outreach around citizenship resources. He and I have met several times, and each time he tells me the Latino community needs more help becoming U.S citizens. Before he even finishes his thought however, Ahmed calls out to nearby friend in case I have any resources for him. The friend is an Indian man in his 70s who, due to a fraudulent attorney and employer, lost his visa status, and has been undocumented for over a decade. He continues to work under the table in the U.S., in order to send money home and support the family hasn’t seen in 17 years. Ahmed’s friend tells me he has worked with several lawyers, and is now just waiting for the laws to change. He has been paying taxes through the social security number he received upon arrival and is hopeful that with a new law he may gain status again. Ahmed shakes his head as his friend speaks, clearly frustrated with the sheer injustice of the situation. I wonder how Ahmed can hear stories such as these and still believe that the Latino community needs more help with citizenship and immigration than ours. Yet have South Asian Americans engaged enough in the conversations and push towards comprehensive immigration reform? Last Tuesday night at SAALT’s Maryland Town Hall on Immigration Reform, I thought back to my conversations with the Ahmed. At the town hall, I had the opportunity to hear three more community members tell their story, and speak on struggles they’ve faced due to our current immigration system. Pratishtha, a student at UMBC and a DREAMer, described barriers to common rites of passage and earned accomplishments that people with valid immigration status can take for granted. Being undocumented she couldn’t celebrate her acceptances into university or obtain a driver’s license the way other students could. Yves, another DREAMer and activist, shared the story of his parent’s deportation and his ongoing separation from them. He described emotions that don’t quite translate into words, including the sorrow of not being with his parents to celebrate their 22nd wedding anniversary the next day. Finally, Mini, stood up and shared how she left behind her family in Kerala for a job opportunity as a domestic worker. Yet, she was so exploited and mistreated in her position that she had to run away, losing her visa status in the process. Today, domestic worker meetings at CASA de Maryland are her lifeline and inspiration, as she too waits for a new law that will give her pathway to citizenship. The struggles that each of these community members faces is unique, yet an overarching theme rang strong; in the South Asian American community, the time is now to fix our broken immigration system. Our community, like the Latino community and many others, is in dire need of a comprehensive immigration reform. After the community members spoke, the audience had a chance to hear an analysis of pieces and ask questions about the Senate immigration bill (S. 744) from SAALT’s Policy Director Manar Waheed, CASA de Maryland’s Legal Program Manager Sheena Wadhawan, and Caseworker Angel Colon-Rivera from Senator Ben Cardin’s office. Despite the need for a comprehensive immigration reform in our community, it was clear from the questions and comments made by the audience that there are many flaws in the current version bill. Though the Senate Bill represents a huge step forward in the immigration debate and proposes many positive changes, it is still needs much work, particularly in with respect to family reunification and an effective and inclusive prohibition on the profiling, among others. As various immigration bills are currently being debated in the House and the outcomes in the House and Senate still need to be resolved in Conference Committee, there is still time to ask for changes and make our voices heard. After a powerful two hours of sharing stories, analysis from the panelists, and questions and comments from the South Asian American community on immigration reform, it is unmistakable that we need to take action. We need to put a South Asian face to the call for immigration reform. Let’s continue to share our stories, for the undocumented senior who hasn’t seen his family in 17 years, and never met his grandson. Let’s call on our representatives to take action for the legal permanent residents who are tirelessly working and waiting, sometimes decades, for the siblings and adult married children they sponsored to gain their visas. Let’s demand that our government prohibit the baseless and ineffective measures of profiling that violate the civil rights of all Americans. Let’s rally behind Yves, Pratishtha, and Mini who deserve unrestricted access to higher education, real living wages, and family reunification. Please join SAALT and engage in the discussion around immigration reform by sharing your immigration story, and joining our upcoming town halls in Houston and Detroit. *Some of the names in this entry have been changed to protect the privacy of the individuals. SAALT will be hosting more conversations on immigration reform. View our calendar of events for more information.